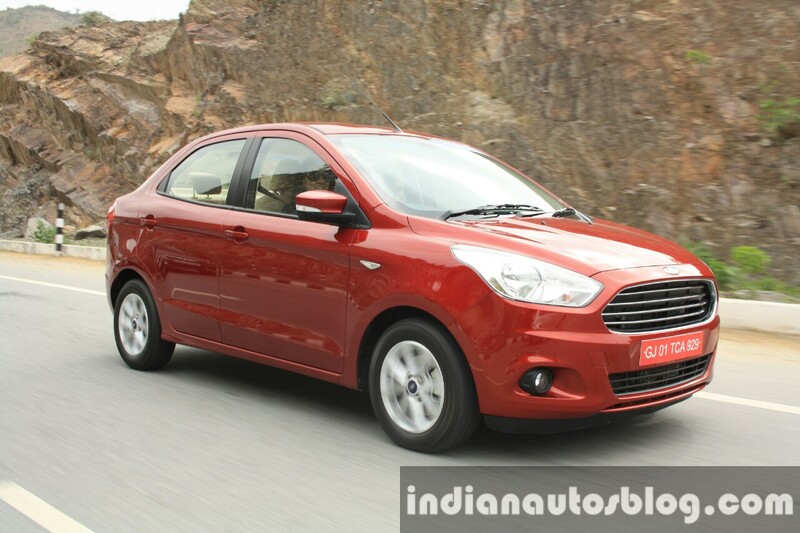 Ford's first ever sub-4m compact sedan. Being the price-conscious lot that we are, the "sub-4m sedan" is probably the only way manufacturers can gauge a customer's attention; the sort of customer who is looking to not spend a fortune on a bigger mid-size sedan, but would still want to own the revered body style. For most Indians, a sedan is still considered as a status symbol. 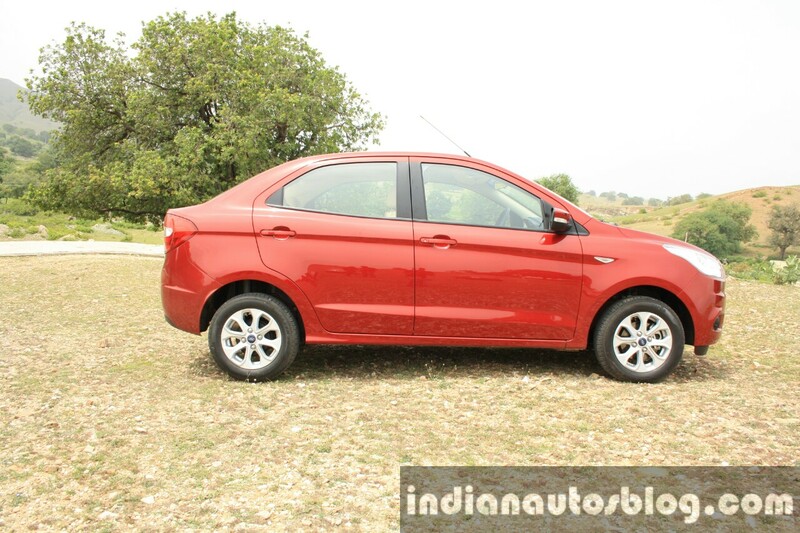 This is where the compact sub-4m sedan with its excise duty advantage steps in. In the sub-4m sedan segment, the Maruti Dzire is the highest selling car. 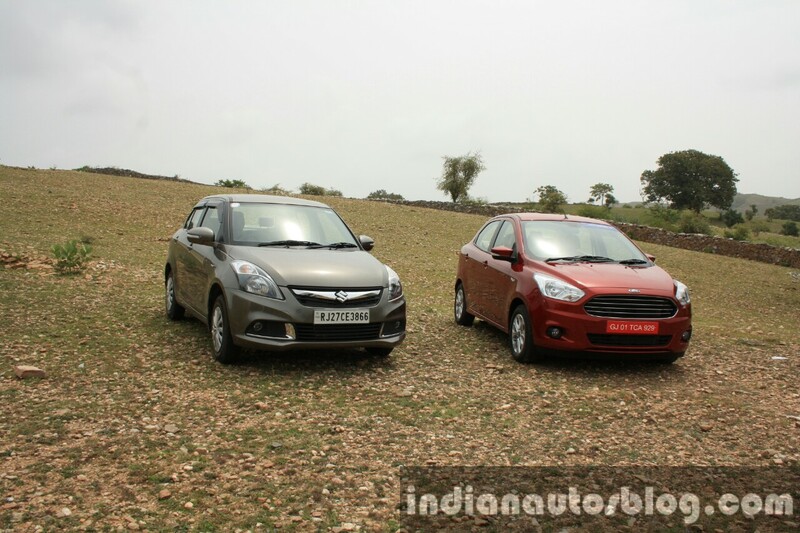 With the popularity of sub-4m sedans growing in the entry-level car market, fueled by the success of India-specific products like Maruti's Swift Dzire and the Honda Amaze, Ford India may have been a bit late to the party. However, like with the Ford EcoSport, the company took their time to study the market scenario and customer preferences, and those results have culminated into one compact, sub-4m sedan which Ford decided to call the Ford Figo Aspire. Going toe-to-toe against established rivals in the sub-4m sedan segment, the Ford Figo Aspire will need the looks to impress, the features to brag on, the power to play with, and the prices to seal the deal. It's a tall order for Ford, but it could also mean sleepless nights for rival companies, should the Figo Aspire become a success when launched in August. 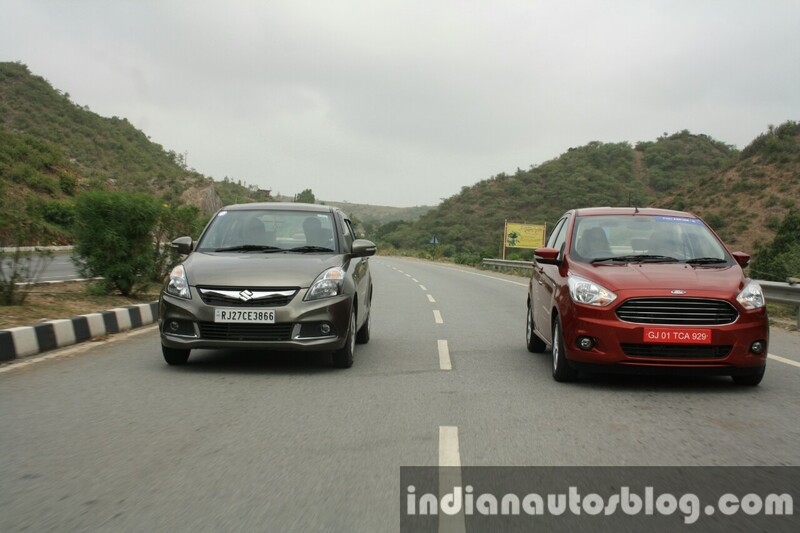 So does the Figo Aspire have what it takes to mirror the success of the Ecosport in the compact sedan segment? Let's find out. Can't help but shake off the Aston Martin familiarity with that chrome-slat front grille. The design of the Ford Figo Aspire follows Ford's global design language that influences products like the Ford Fusion and Taurus, as evidenced by the large Aston Martin-esque grille flanked by the swept back headlamps. The lower front fascia is a bit monotonous, featuring a pair of standard round foglamps and black central intake, while the contoured engine hood and flaring wheel arches add a sense of presence and power to the Figo Aspire. Ford has managed to keep the design simple and elegant, although the rims look a bit too small. Coming to the side, it's instantly clear that Ford wanted to maximize interior space, whilst keeping overall length strictly under 4 meters, which can been inferred by the long wheelbase and short overhangs. The sculpted shoulder line that begins from the tiny chrome element in the front wing helps add a new dimension to the side profile. It sits on multi spoke 14-inch alloy wheels (steel rims for lower Ambiente and Trend trims), which look a bit too small for the exterior and ground clearance. The door mirrors are designed in such a way that the driver gets a satisfactory view of the rear whilst keeping the overall narrow width of the whole car in check. Hats off to Ford for not cutting and pasting a boot. It looks like a sedan designed from the ground-up. The rear-end design is an aspect Ford's designers have to be appreciated for. It doesn't appear to look like a hatchback with a boot cut and pasted, but rather a proper sedan. Features include wraparound taillamps connected by a long chrome appliqué. Underneath that is the large "Figo Aspire" badging for onlookers to identify, since it's Ford's first attempt at such a product and product identification is a key to further growth. Like the front, the rear also keeps it simple, with the only a single large chrome appliqué between the two taillamps. 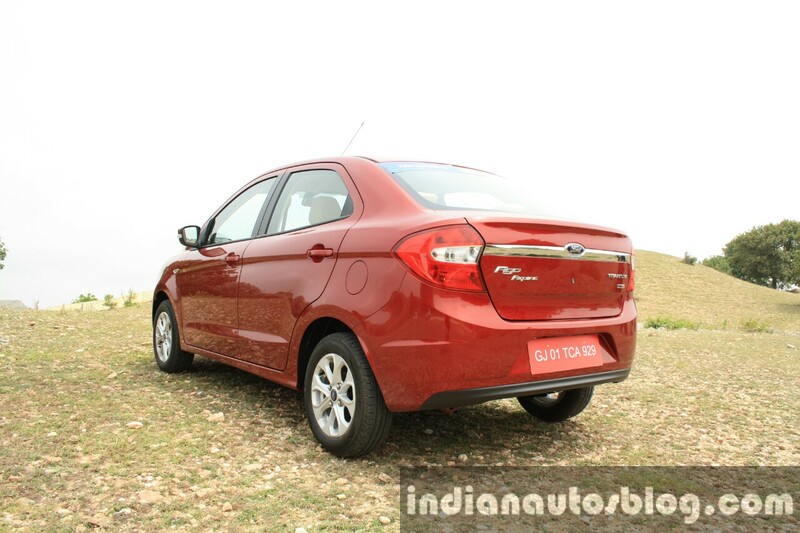 Overall the design of the Ford Figo Aspire isn't going to win any awards, but it sure does look better than any of its rivals in the segment. Particularly in the Titanium variant that we tested, it exudes a sense of elegance that would garner people's attention. However, we do get a feeling that Ford skimped on newer exterior features such as projector headlamps, LED DRLs, bigger alloy rims, and a shark-fin antenna to better equip the interior. That being said, the company has done a good job of dressing up their first sub-4m sedan with a sporty yet elegant exterior. 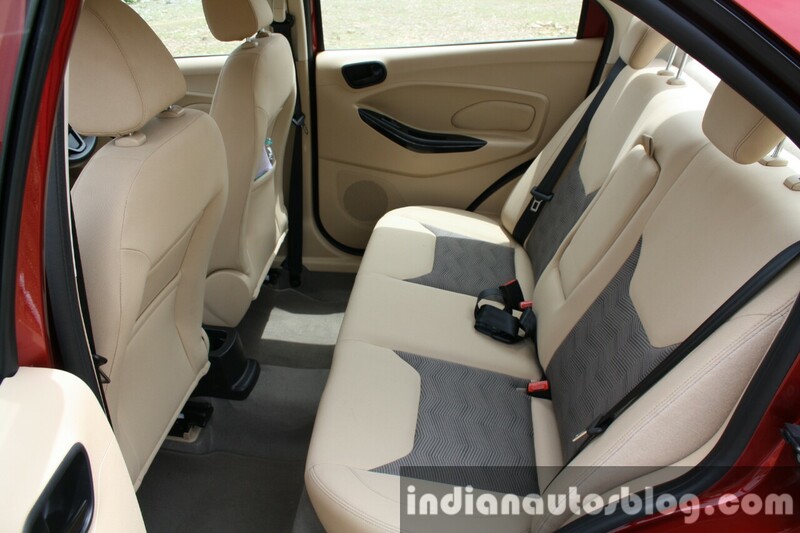 A welcoming interior with oodles of space for a sub-4m sedan. Getting in and out of the Ford Figo Aspire is fairly easy, despite the author being above 6 feet tall. Once inside, the doors close with a cheap click that otherwise hampers the build quality of the interior we are about to explore. 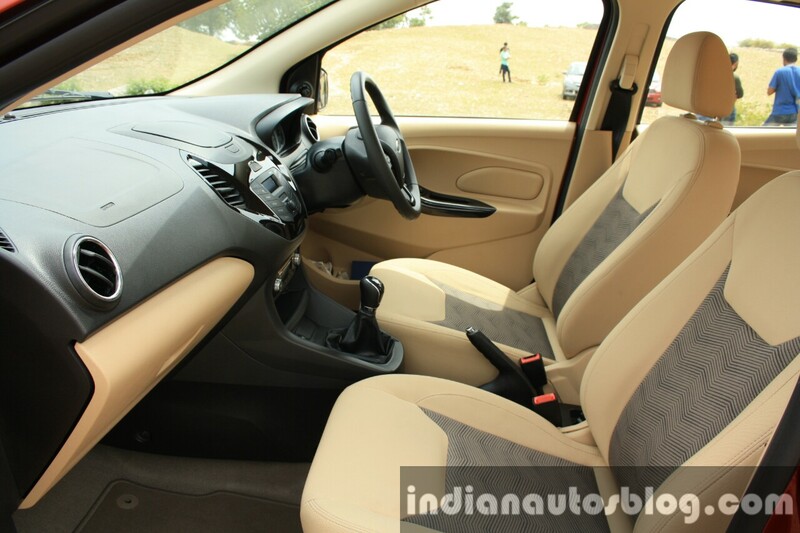 To a Ford EcoSport or Fiesta owner, the interior of the Ford Figo Aspire would be all too familiar. To a customer who has not been acquainted with the former models, it's very easy and quick to get around the controls and features. Seats are fairly comfortable on long drives. Broad people may find it a bit uncomfortable though. 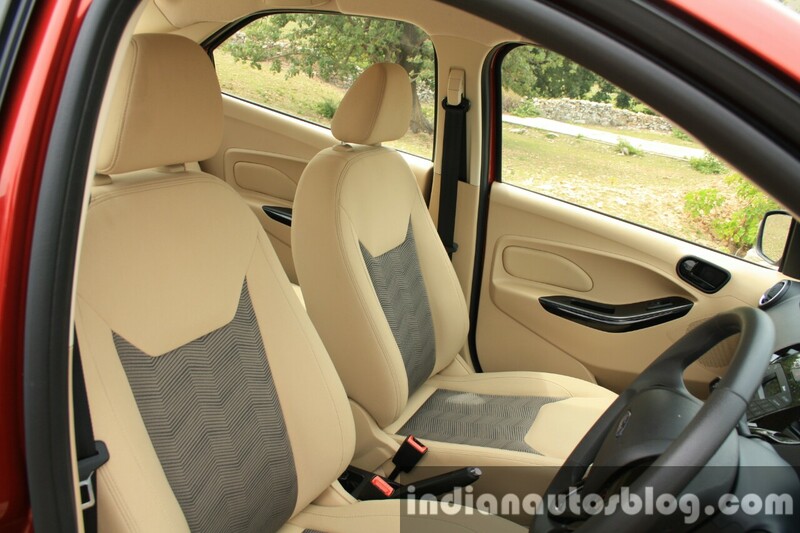 The trim that we tested was Titanium, which gets fabric beige seats, a dual tone dashboard and good level of equipment. Comfort wise, the seats were fairly decent during long highway drives, with adequate support for the back and thighs. Generous legroom and headroom for rear occupants (again, with respect to a sub-4m sedan). The rear cabin was comfortable and well spaced for shoulders and legs, thanks to the sculpted front seats. Tall people sitting at the back wouldn't have to worry about headroom, as it is quite generous for a sub-4m sedan. Any more headroom, and the roofline of the Figo Aspire would've ended up looking deformed. A foldable armrest is present at the center, should there be no passenger on the middle seat. 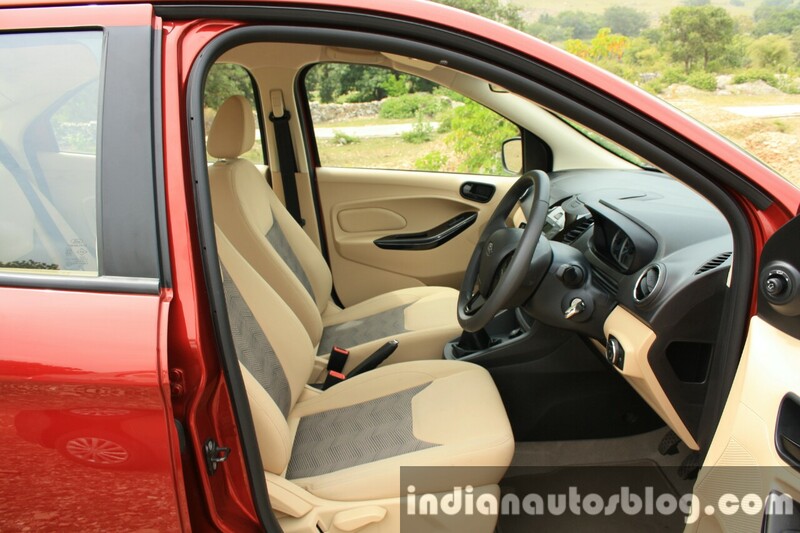 Inspired by the Ford Ecosport, it gets a sporty and ergonomic interior design. 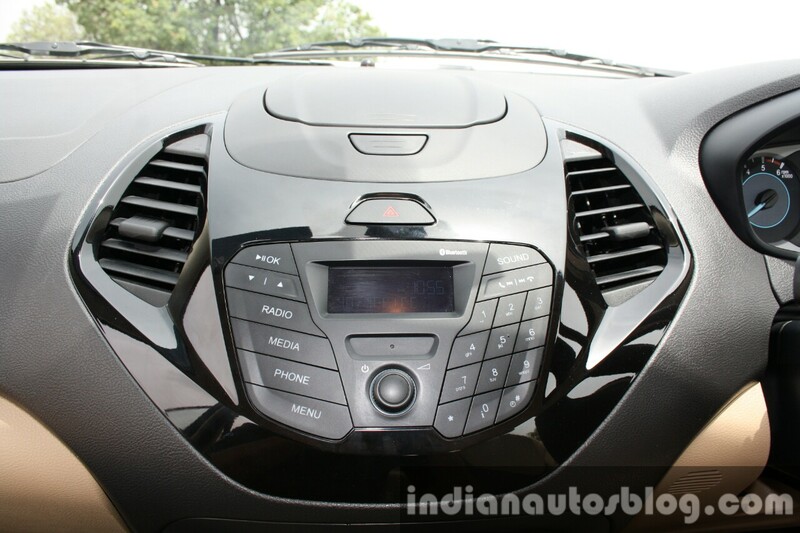 Featured image is of Titanium Plus with SYNC infotainment system. 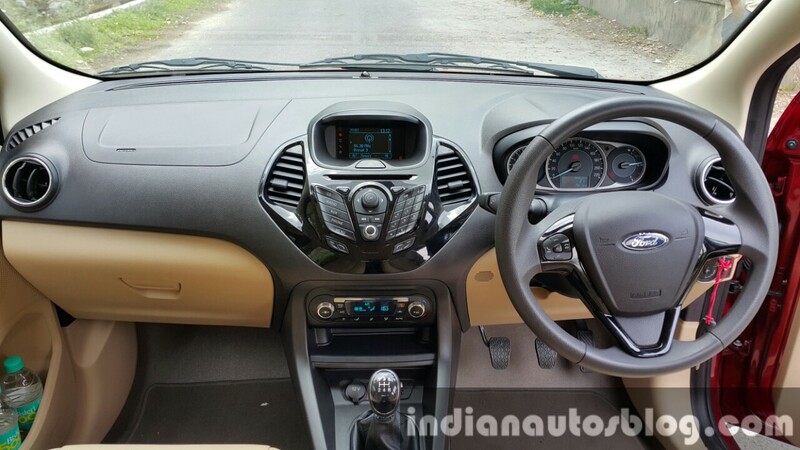 The dashboard follows a familiar design, which is quite a departure from the basic first generation Figo. Taking the center stage are the controls for the music system and Bluetooth connectivity. The buttons themselves are large and easy to read, so that the driver wouldn't have to take his eyes off the road for seconds longer. However, the center console housing the buttons is finished in piano black, which is dust prone and easily messed up with fingerprints. Glossy piano black center console is prone to dust and fingerprints. Buttons feel solid with clear lettering. While the Titanium Plus variant features Ford's SYNC infotainment system, the lower variant gets a "MyFord Dock", which is essentially a dock for a smartphone. 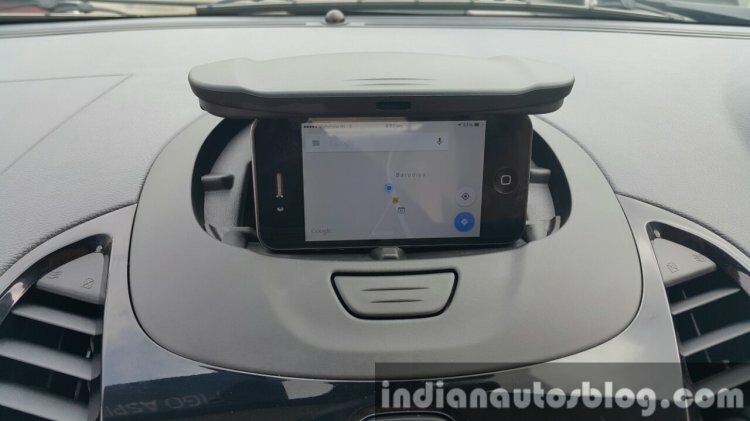 Along with battery charging, the smartphone can also double up as a make-shift infotainment system, complete with onboard navigation. Say goodbye to phone stands with Ford's docking feature. However, it's useless if you own a phablet. Straightaway, we found out that this feature cannot accommodate large devices (say phablets) comfortably. Later when we managed to obtain a smaller device, the MyFord Dock proved to be very useful. So, goodbye to those crummy phone stands for good. The 3-spoke steering wheel is well sculpted and nice to rest your thumbs during long drives. Only the left spoke gets mounted buttons for the music system. Despite offering a bluetooth system, the steering wheel in the Titanium trim didn't feature specific buttons to pick/drop calls (otherwise featured in Titanium Plus). Steering wheel is well sculpted and feels good to hold onto. Another aspect to note is that unlike other Fords, the Figo Aspire has the indicator stalk on the right side and the wiper functions on the left. 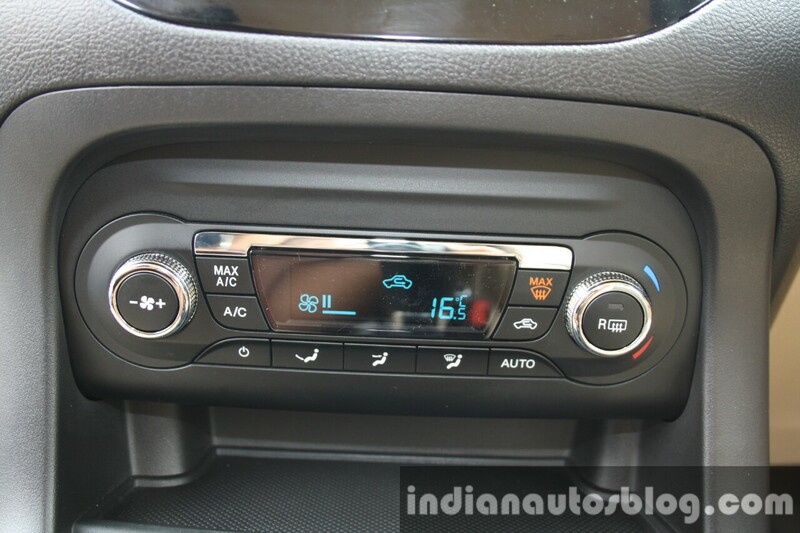 This could be perplexing to customers who are well familiar with Fords, but a welcome change for people upgrading to the Figo Aspire from a Maruti. The instrument cluster houses a set of clear instrument dials and a small MID (multi-information display), which displays vehicle data like average mileage, distance-to-empty, and average speed. 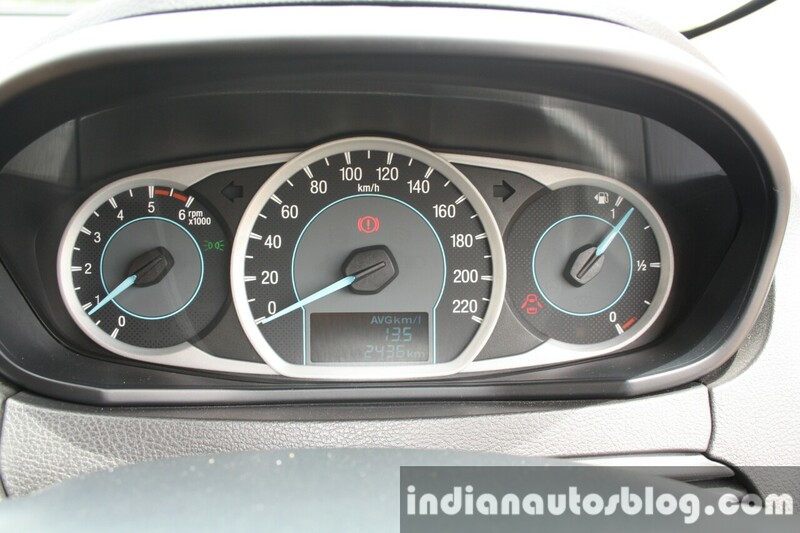 The Figo Aspire also features an Economy mode that activates the gear-shift indicator. It is represented by a small arrow in the tachometer, and only lights up when the car wants the driver to shift up. HVAC dials feel good to the touch. Ford should've adopted such dials for the infotainment system as well. The dials of the HVAC (heating, ventilating, and air conditioning) controls feel good to the touch, and the HVAC system gets a separate display. Speaking about the HVAC system, it manages to cool the cabin in a relatively short time, which proved to be a relief in the hot weather of Udaipur, Rajasthan (the place where we tested). Titanium and Titanium Plus trims are equipped with an automatic climate control system as standard. Ingenious storage space for ermm...something. 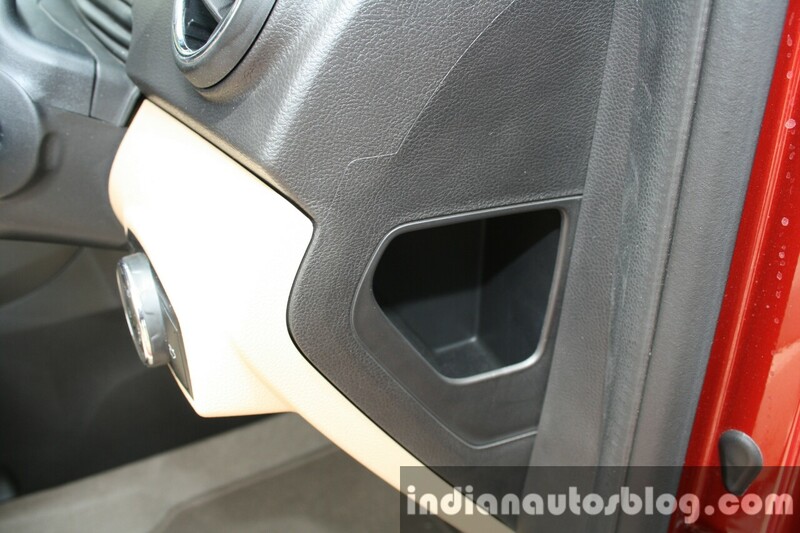 One of the biggest highlights of the Ford Figo Aspire is the interior storage space. It has 20 of them! Other than the plethora of bottle/cup holders and large glovebox, the interesting one was the storage space on the extreme side of the dashboard, which is revealed when the door is open. The 359 liter boot isn't as generous as what rivals offer (say the Hyundai Xcent with a 407 liter boot). Overall, a lovely interior design with a good beige/black color combination. Build quality leaves something to be desired. 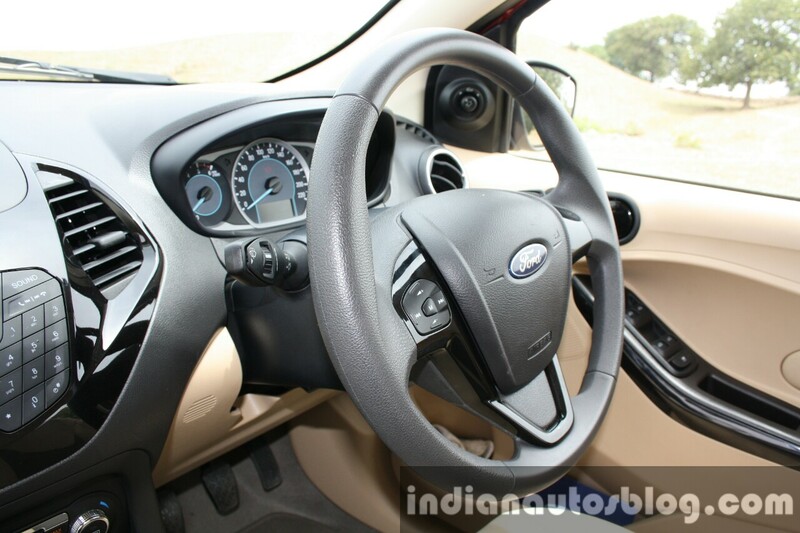 To sum it up, the interior of the Ford Figo Aspire is a good place to be in. Although the build quality and choice of materials at some areas (like the door panels and dashboard) isn't as impressive as we expected, the ergonomic center console design, sporty steering wheel, storage spaces and the generous cabin space is enough to garner positive attention from critical customers. Ford's 1.5-liter TDCi engine now produces 100 hp, which translates to quick figures. 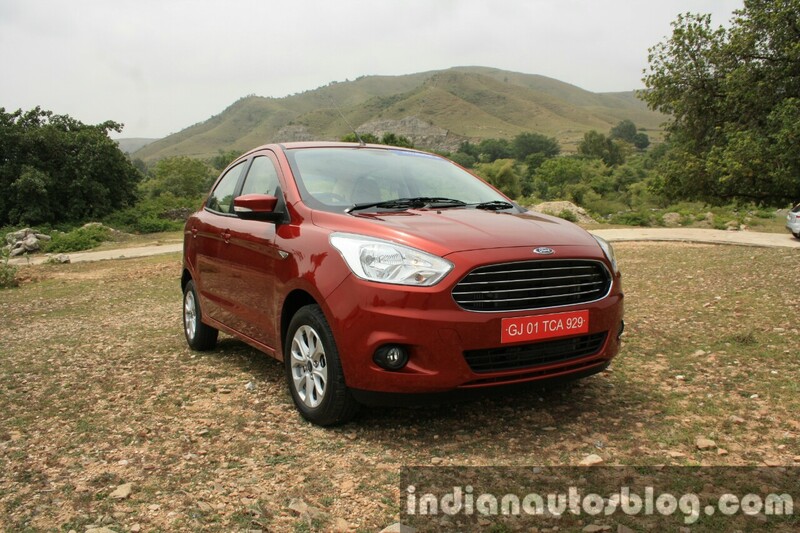 The Ford Figo Aspire diesel is powered by the familiar 1.5-liter TDCi Duratorq diesel engine, which has been retuned to produce 100 hp and 215 Nm of torque in the sub-4m sedan. Although the horsepower figure is same as the Honda Amaze diesel (currently the most powerful sub 4m diesel sedan), it produces 15 Nm more torque. The engine is paired to a 5-speed manual transmission as standard. Initial impressions? Excellent, to say the least. With 100 horses to tap and a relatively light curb weight, the 1.5 diesel leaps towards triple digit speeds without breaking a sweat. From a slow pace at 2nd gear, the low range performance of the Figo Aspire isn't anywhere near bad, as evidenced by brisk take-offs after trotting over speed bumps. Uprated engine has smooth performance throughout all rev ranges, and effortlessly cruises to triple digit speeds. Once you cross 1,500 rpm, the turbo begins to spool, followed by the addictive feeling of the car lunging forwards. The mid-range performance is definitely a forte of the 1.5 diesel, where it effortlessly surges ahead. Even at speeds of above 120 km/h with four occupants inside and HVAC system at full blast, the engine didn't feel strained. 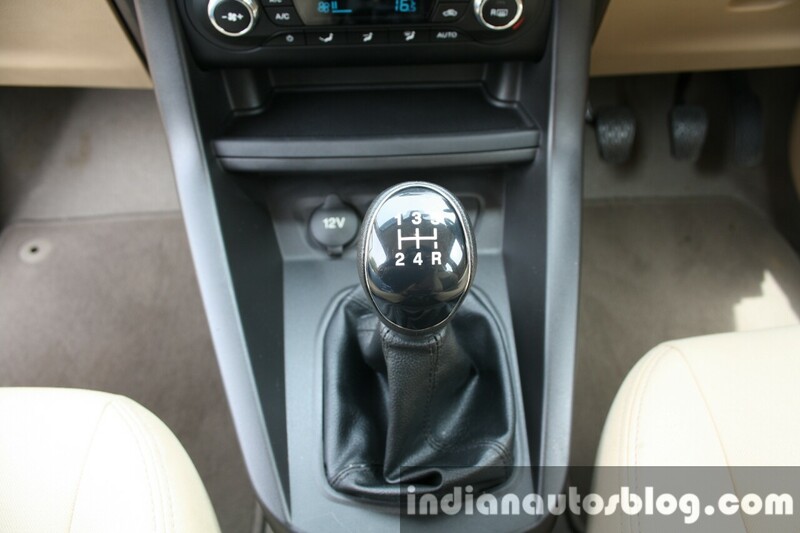 5-speed manual gearbox only for 1.5 diesel and 1.2 petrol. Although the gear shifts aren't as super smooth as other cars, it did not have us complaining all the way. Power delivery of the engine towards the front wheels was refined, save for the engine noise insulation into the cabin, which has some room for improvement. Still, it isn't as bad as the 1.5-liter i-DTEC diesel in the Amaze. While we talk about high speeds and powerful engine performance, you must be wondering whether the Figo Aspire would empty its 40 liter fuel tank faster than its rivals. According to ARAI, the fuel consumption figure is rated at 25.8 km/L, which is tied with the Honda Amaze, but is less fuel efficient than the 26.59 km/L Maruti Swift Dzire. 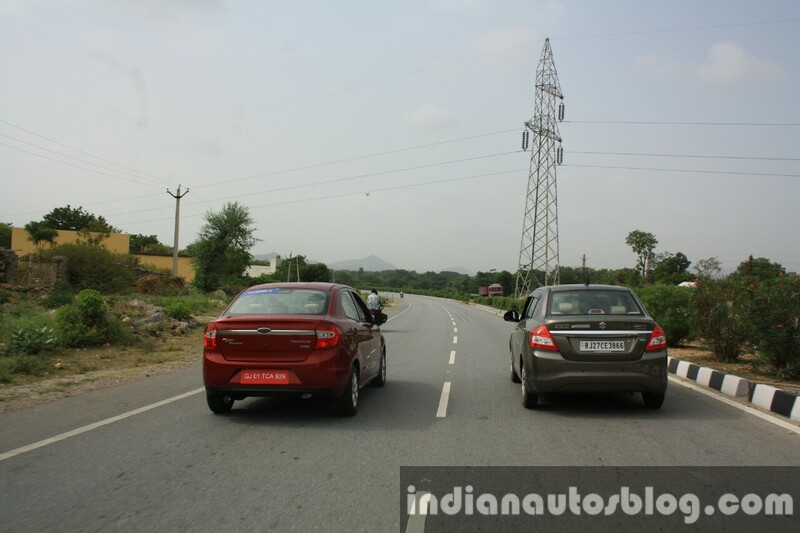 Realistically, we managed to achieve an average fuel mileage of 13.5 km/L as recorded by the car, which is not bad considering that we were at triple digits on highways for a good duration, followed by crawling around the traffic-congested city of Udaipur. With good interior space and comfortable seats, the Figo Aspire must have a good ride quality to seal the deal, which it does. 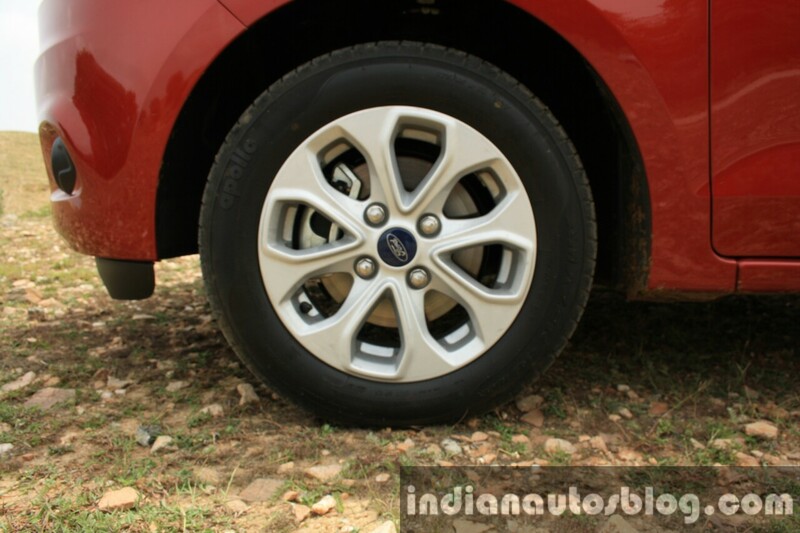 The ride quality of the Ford Figo Aspire is, surprisingly, very good for a suspension that is tuned to a slightly softer setting. With a basic McPherson strut system and anti-roll bars in the front, and semi-independent torsion beam with gas and oil shocks at the back, it somehow manages to offer the best of both worlds. For the enthusiast, the Aspire doesn't heave and roll around the place, thus instilling confidence for spirited driving. Thanks to the smooth exterior design and firm suspension, it doesn't feel unstable or noisy at high speeds. The relaxed driver will appreciate the fact that it manages to soak most bumps with relative ease, although jerks from deep potholes do penetrate in the cabin. That being said, the Ford Figo Aspire is a comfortable car to drive around, and is one of the well-composed models in its segment. The electric power assisted steering (EPAS) in the Ford Figo Aspire gets fairly light and easy-to-turn in cities for quick maneuvers, while it weights up just about right at high speeds. Although it doesn't generate as much road feedback as a hydraulic steering system would, the EPAS in the Figo Aspire does a good job of turning into corners with the right amount of weight and little feedback. Complementing the steering feel is the chunky 3-spoke steering wheel that is a delight to hold onto. 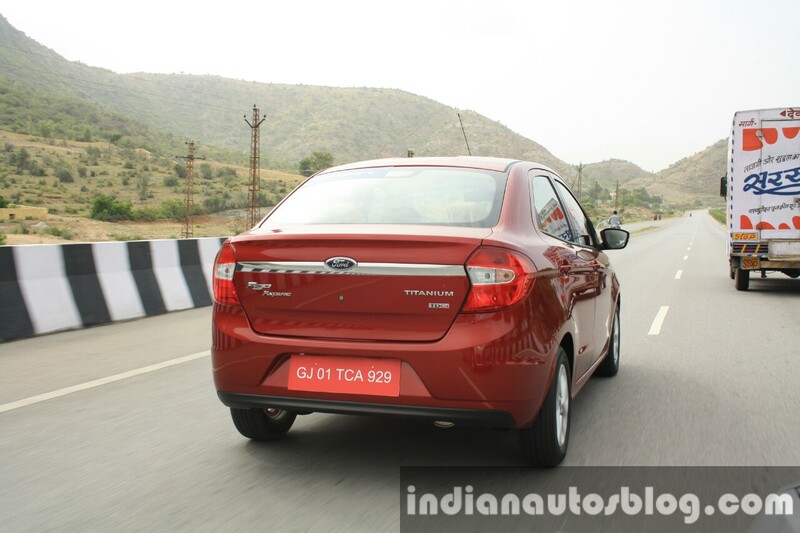 At high speeds, the Ford Figo Aspire feels very stable and relatively less noisy. 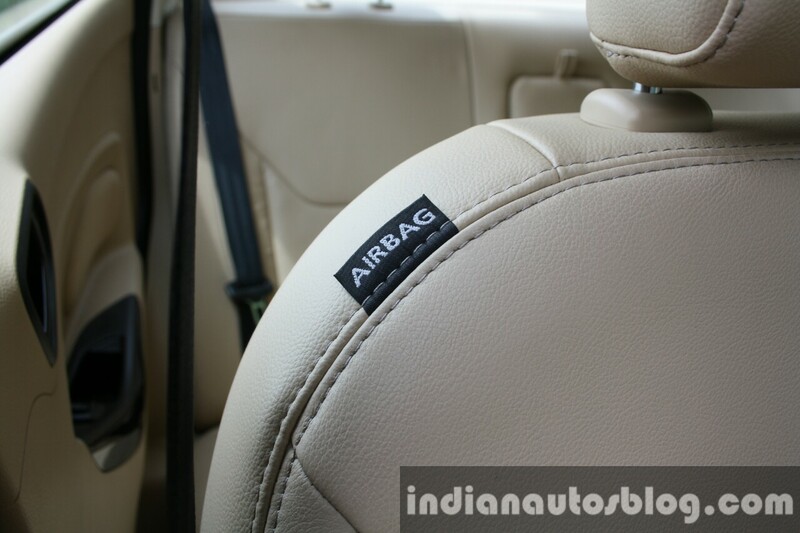 Titanium Plus variant comes with not two, but 6 airbags, which is first-in class. 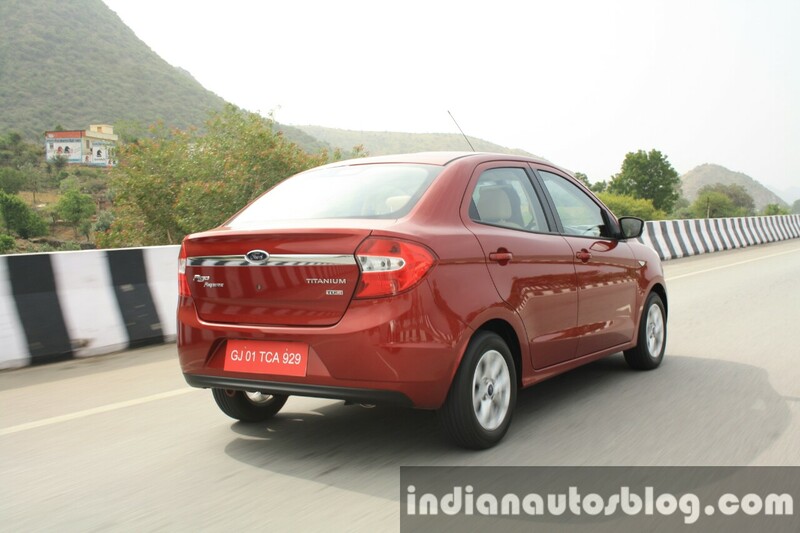 The Ford Figo Aspire is the first car in the segment to offer more than two airbags in its highest variant. While the car comes standard with dual airbags in the front, the Titanium Plus variant adds a pair of side and curtain airbags, thus offering six airbags in total. Ford claims that 45% of the body structure is made from high strength steel, which further increases the rigidity and strength of the car. However we'd have to wait for an NCAP test result before making conclusions. In models equipped with the 6-speed dual clutch automatic, the Ford Figo Aspire comes with ESP, TCS and a Hill Launch Assist as standard, which is also a first in the segment. 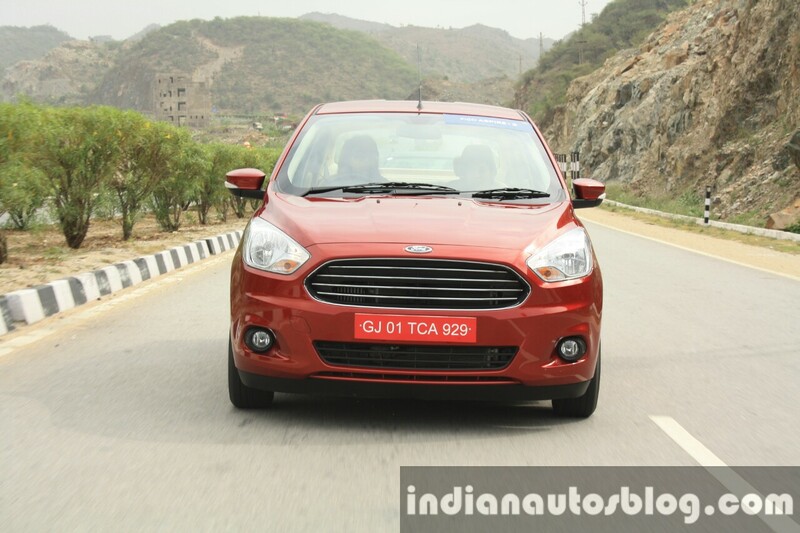 Ford have kept the prices of the Ford Figo Aspire under wraps, at least until its launch in August. 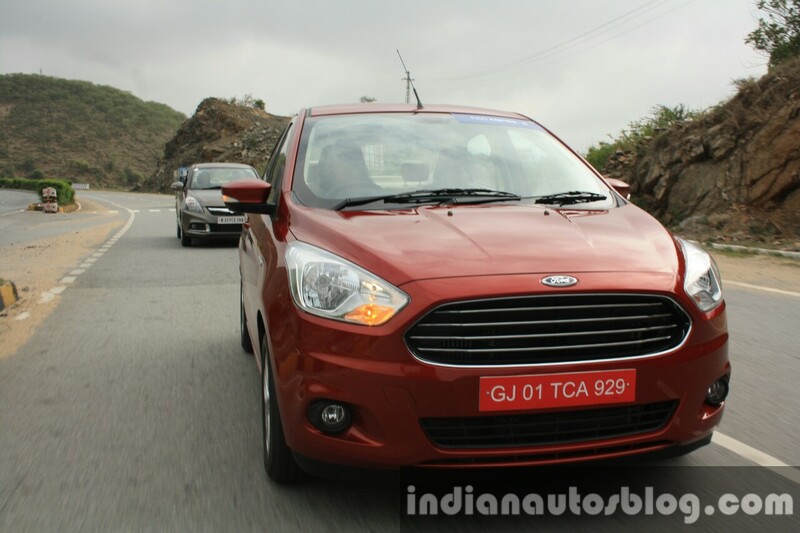 Bookings will start this month, as confirmed to us by Ford India MD, Nigel Harris. The company has promised that they will offer a smooth and less-expensive ownership experience. With good localization levels at its new manufacturing facility in Sanand, Gujarat, the Figo Aspire could be competitively priced. With a huge amount invested in a new production plant and future development costs, Ford would desperately need the Figo Aspire (as well as the Figo hatchback) to generate solid sales figures and help increase their overall market share. While the EcoSport was a huge success when launched, in what was then a two-horse race for the compact SUV segment title, the Ford Figo Aspire has a Maruti to reckon with, India's most familiar and highest selling brand name. In fact it was the Maruti Swift Dzire that turned everybody's attention towards the sub-4m sedan, despite the Tata Indigo CS being the first to establish the odd segment. 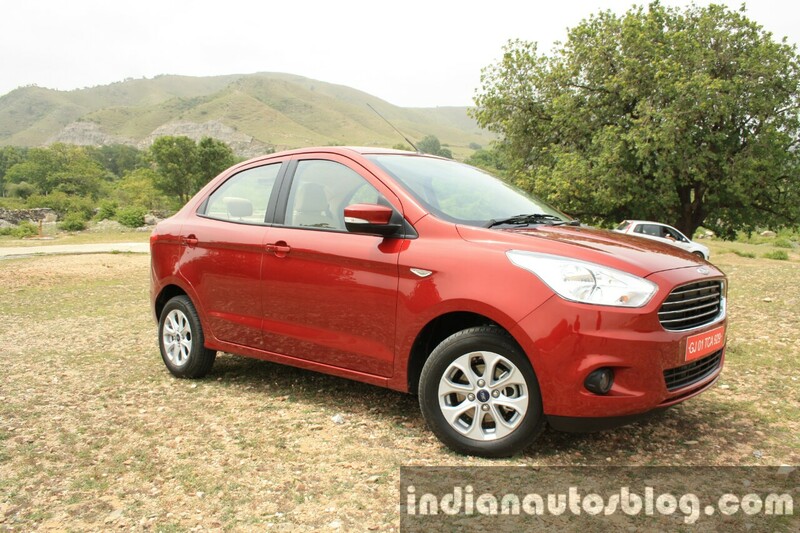 So does the 2015 Ford Figo Aspire stand a chance against its well established rivals, despite being the late entrant into the segment? Without a doubt, a resounding YES! It is clearly the best looking car in the segment with an elegant design mixed with a hint of sportiness, and the one with most attention towards passenger safety. The interior is generously spaced and comfortable for a sub-4m sedan, as well as feature packed with equipment like a dedicated SYNC infotainment system and Ford MyKey. The revised 1.5-liter diesel engine is certainly one of the most powerful and fuel efficient units in the segment, which has the figures to ensure spirited driving performance supplemented by good vehicle dynamics. 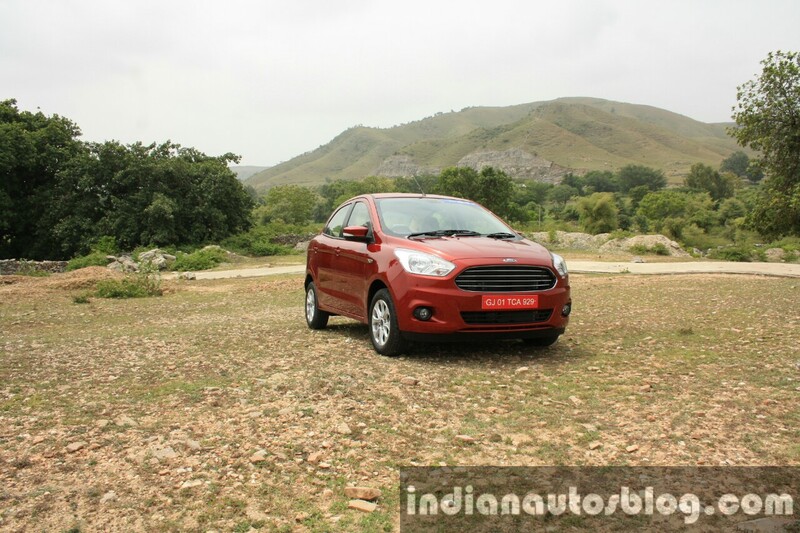 A well rounded exterior and interior package with great driving performance could leave customers aspiring for the Ford Figo Aspire, if the pricing is attractive. Overall, Ford's first attempt at a sub-4m sedan is turning out to be a success-in-the-making. If the pricing and ownership experience turns out to be attractive and smooth, respectively, it could leave customers aspiring to own one.